Molot VEPR 54 complete with Manticore Arms nightbrake, handguard, Belarusian POSP scope, Choate polymer Dragunov stock and 10-round CSSpecs magazine. When I first got into shooting, one of the biggest hurdles was money: Between ammunition, targets, range membership and the cost of gas to get to that range, the sport isn’t exactly conducive to a poor college student’s budget. Luckily, I had two powerful allies - instant noodles, and surplus Soviet arms and ammunition. The latter being the most integral part to my learning to be a better marksman. Frankly, when one can only afford $30 a week for ammo, 7.62x54r and 5.45x39 go much further than .308 Win or 5.56mm brass ammunition - at least that was the case. While no longer true, the affordability of these rounds led this shooter to seeking out new and unique platforms to launch inexpensive rounds from. I bought a pair of Arsenal AK-74M clones, and even an AKS-74u clone from Bulgaria, and they are excellent. Seeking to get into the DMR game on the cheap, I purchased a VEPR 54r from Molot a few years later. For the uninformed, the VEPR series of semi-automatic rifles are based on the Russian RPK light machine gun. This LMG is essentially a beefed up AKM, featuring a 50% thicker receiver, and reinforced barrel trunnion. If the receiver of the VEPR looks familiar, it should. It’s based off an RPK LMG, which itself is just an AKM with a longer, heavier barrel and thicker receiver. 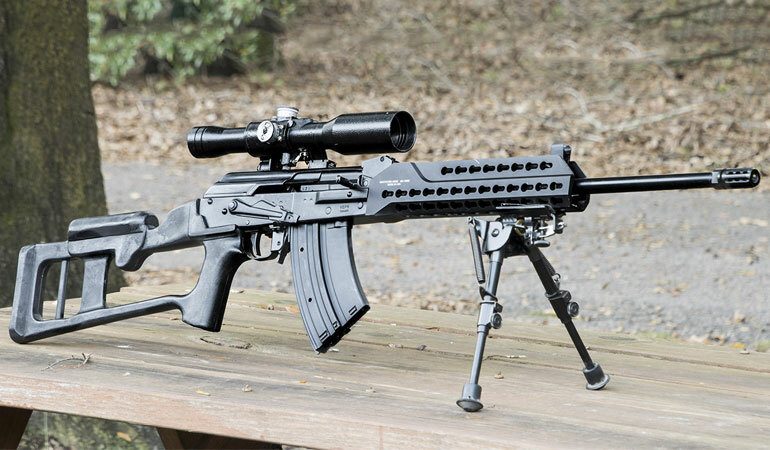 The 54r VEPR takes this to the next level, and chambers the oversized AK in 7.62x54r - a potent, long-range round. Combine this with the famous die-hard reliability of the classic Soviet lead-slinger, and you’ve got a recipe for greatness. At least, that would be the case if not for the factory magazines. 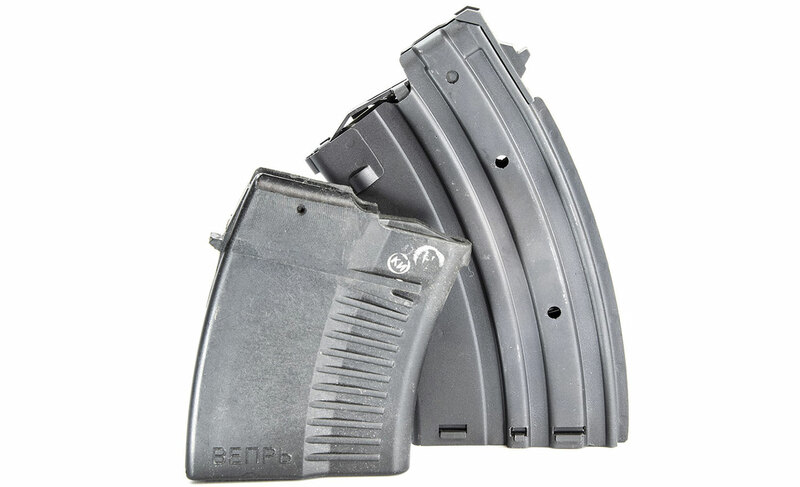 Featuring a polymer body, baseplate and follower, the VEPR 54r magazines only hold a scant five rounds of ammunition. While most shooters can appreciate that five rounds is hardly enough for plinking fun at the range, it’s the magazine’s polymer construction that really raises concerns. While all-polymer magazines are the norm with the AR-15, the AK doesn’t handle them quite so well. Sure, many exist, but AK aficionados consider them to be range-only magazines. A factory polymer VEPR 54 magazine flanked by an all-steel CSSPECS mag. Double the capacity for only a small increase in size. The nature of AK magazine wells, means that mags are rocked in to place. Because of this, weight applied on the magazine while inserted acts as a fulcrum with mechanical advantage against the locking tab on the magazine. Meaning a shooter can accidently put hundreds of pounds of pressure on a small piece of plastic that if broken, renders the magazine unusable. So-called, ‘Bakelite’ magazines were actually made of thermoset phenolformaldehyde resin. They also featured a steel reinforced collar and locking tabs. This is why the Soviets added metal reinforcements to their so-called bakelite magazines (actually thermoset phenol-formaldehyde resin), and why Bulgarian circle 10 waffle-pattern magazines have these same reinforcements. Another alternative are all-steel magazines, but sadly no such VEPR 54r magazine existed, until now. 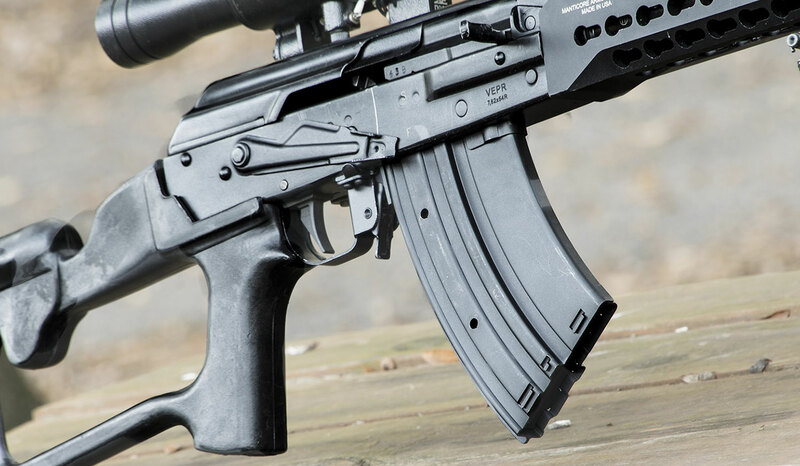 Enter, the CSSPECS 10-round VEPR 54r magazine. 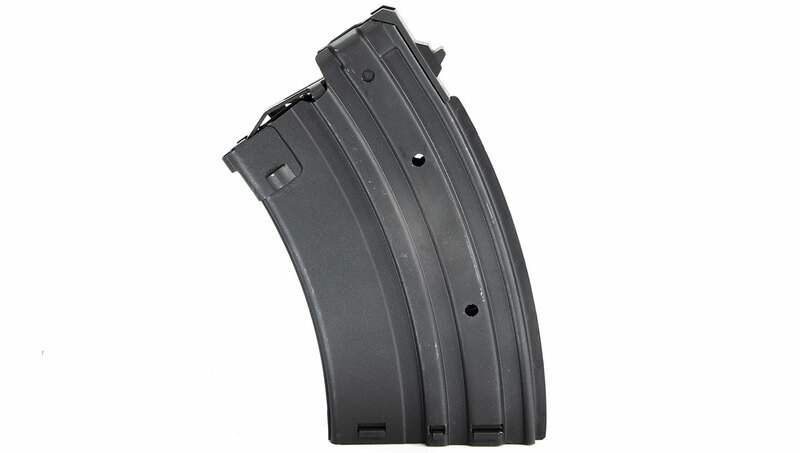 Featuring the same overbuilt design as steel AKM magazines, the CSSpecs mag is more durable, higher quality and less expensive than factory polymer ones. 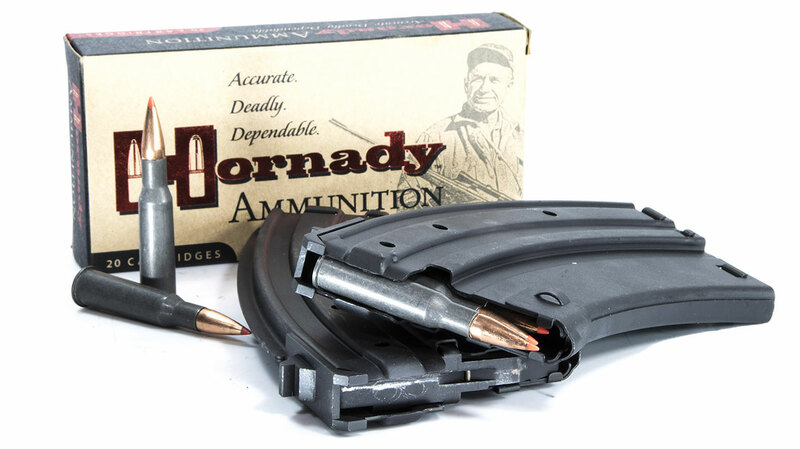 Boasting double the capacity of factory magazines and heavy-gauge steel construction, these magazines are nearly bomb-proof. They feature an anti-tilt steel follower and heavy duty double thick reinforcements at the locking tabs for added longevity. While the magazines are much heavier than the factory polymer ones, they’re also roughly 50% less expensive and vastly superior in terms of durability. In testing, the new magazines functioned 100% reliably. This was with three different types of ammunition - Bulgarian silver tip, Soviet surplus and new-production Hornady hunting rounds. The only aspect of these magazines that doesn’t surpass the originals, is how difficult they are to load. This isn’t the result of overly-strong springs, but rather the cartridge’s design itself. The “R” portion of 7.62x54R stands for rimmed, this rim makes extraction from a rifle’s chamber easier. But the rimmed round was designed for bolt-action firearms, not auto-loading ones. This is one of the biggest reasons that magazines for rifles chambered in this cartridge tend to be limited in capacity: “rim lock”. The same issue plagued British designs utilizing their rimmed .303 round. It’s one of the reasons the Bren LMG uses gravity-assisted magazines. Coupled with quality, expanding ammunition from Hornady, the VEPR 54 using CSSpecs magazines makes for an excellent hunting rifle. For civilian shooters, this equates into difficulty correctly sliding rounds fully rearward in magazines. It’s not the end of the world, but it’s somewhat frustrating when compiled with a rigid steel magazine digging into your loading hand. Another minor issue deals with rifle compatibility. Certain generations of the VEPR 54r feature a bolt whose geometry differs from the original models. This extra 1/16 of an inch of material can cause feeding issues with these magazines. Thankfully, CSPECS website includes instructions on how to modify your bolt with a hand file in only a few minutes, and detailed instructions on identifying which type of VEPR you own. Other than that small “issue” These new magazines are a slam dunk! Shooters looking to add or replace their VEPR 54r magazines should consider these over factory offerings.